Once again, the Procter and Gamble Company (P&G) launched its GIVE HOPE program, now in its fifth year, during October’s Breast Cancer Awareness Month. GIVE HOPE is a partnership with the National Breast Cancer Foundation, Inc., (NBCF) aimed to raise awareness about breast cancer and to help create a prevention plan for women to become more proactive with their health. P&G Spokesperson Valentina Sanchez shared with Lawndale Bilingual Newspaper the importance of raising awareness and how you can become involved in the campaign. P&G has a commitment to social responsibility. This year, we are continuing the support by joining with the National Breast Cancer Foundation, again, to promote early detection via the program and campaign that’s called, Give Hope. The campaign is really designed to rally women to take control of their breast health, to take action, and create a prevention plan in the fight against the disease. We all know breast cancer is of concern, as you know it doesn’t discriminate against. Unfortunately, breast cancer is the number one cancer among Hispanic women so that’s why we are very committed to this campaign. We are super proud to be working on this campaign that helps raise awareness. We are encouraging people to go to www.facebook.com/pgmygive and create their own custom profile and share their story with P&G. For every new profile, P&G will donate $1 to the National Breast Cancer Foundation. Also, the other way people can become involved is to redeem P&G coupons. Every coupon you redeem throughout the month of October, we will donate $0.1 to NBCF. It’s definitely worth every penny. Last year, we collected more than $500,000 in donation. So that is something that really makes us proud. As a P&G employee, I also had the opportunity to share a personal story with breast cancer in my family. So this is a topic that touches me personally. This is our fifth year partnering with the Breast Cancer Foundation to support their efforts and to encourage women everywhere. Once we help raise awareness, we want to drive the action. We want the community to take action in creating their own prevention plan. 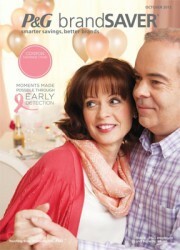 You can visit www.nationalbreastcancerfoundation.org for more information.